The organ was designed and built in 1992 by Kenneth Tickell and Company Ltd of Northampton. It was specifically designed to fit in the space available under the arch where it is sited, thus freeing up space behind it to become what is now the Lady Chapel. The consultant to the church was Dr John Rowntree. 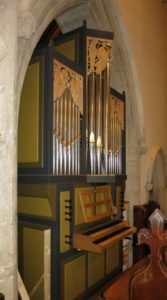 The casework of this organ is painted in subtle shades of grey and green with touches of red and gilding on the front pipe mouths, impost and carvings. In contrast, the console is of polished oak, with key coverings of boxwood and ebony. The carvings by Derek Riley depict angels sounding trumpets, and take their inspiration from nearby stonework. The design of the organ is very compact: all the manual pipes are arranged on a common soundboard with the eight foot stops sharing a common bass, and the Sub-bass pipes stand on a separate chest behind the main case. Open metal pipes are cut to length and cone tuned, while the flutes have soldered tops and flexible ears for tuning.